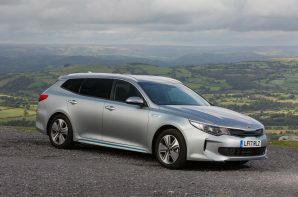 The KIA Optima is far from a common sight so chances are you probably didn’t know that not only can you get an estate (or Sportswagen or KIA speak), you can combine it with a plugin hybrid drivetrain. Its a combination that makes a lot of sense to us because you often end up buying an estate to cover the tricky journeys but then spend most of your time one up commuting burning more fuel than you would like. KIA’s answer to this thorny problem is an 11.26 kWh battery (gross) which powers a slimline electric motor that sits within the automatic gearbox taking the place of a torque converter. Fully charged it provides up to 38 miles of electric running on the official tests. The package is completed by a 2 litre direct injection petrol engine which allows hybrid running and a total theoretical range of 695 miles. The driving experience is dominated by two quirks of the KIA system. Firstly unusually for a hybrid it doesn’t use a CVT gearbox. Instead you get a 6 speed auto, which on face value is a very good thing as CVT’s are weird. However in the context of hybrids they are bettered suited to the job so an extended test drive is essential to determine if the auto ‘box setup works for you. Secondly in common with most plugin hybrids, the Sportswagen feels best in EV mode so make sure you get a go with a full battery pack and with a depleted one. Despite having an EV setting the petrol motor will still start up if the car thinks the electric motor needs some help. We would prefer an EV lock mode or more warning of engine startup to maximise EV running. Integrating the battery pack has required some compromises in packaging with the fuel tank reduced from 70 litres to 55 litres and more importantly for an estate boot space pegged back from 552 to 440 litres with seats up and from 1686 to 1574 with the seats down. The good news is that the space that is lost was under the boot floor so above decks there is no difference. As ever with plugin hybrids your daily mileage is crucial to get the best out of the system. In the real world 20 – 35 miles of electric running is possible so if your regular journeys fall within this range you can maximise the EV potential. After that 45 + mpg is feasible, with gentle running delivering around 60 mpg. Helpfully KIA publish an official extra urban mpg of 54.3 mpg which is about right. The KIA Sportswagen is a good option if you often cover less than 30 miles between plugin opportunities, need an estate car, and want the option to cover longer journeys with the convenience of petrol. It isn’t the most engaging car to drive but if driving dynamics aren’t top of your list it is worth a look.